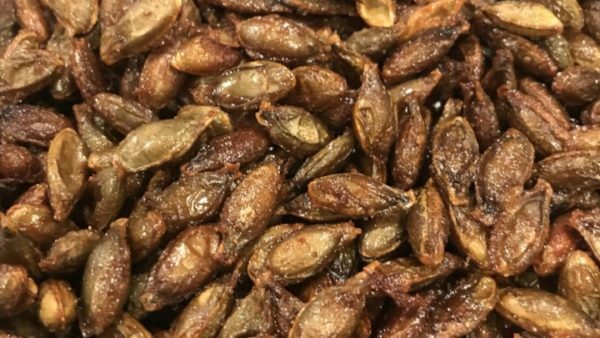 These pumpkin seeds certainly aren’t the ones you’ll remember from the days roasting pumpkin seeds with mom or grandma when you were a kid…but they’re sure to be a hit on game night with the grown ups! They’re made with whiskey and bacon drippings! If you make them, post them on social media and tag us! You know the drill! Stir pumpkin seeds, whiskey, bacon drippings, brown sugar, and 2 teaspoons salt together in a saucepan over medium-low heat. Bring mixture to a simmer and cook until the seeds begin to turn gray in the middle, 15 to 20 minutes; drain. Spread the drained seeds onto a baking sheet in a single layer; season with salt. Roast the pumpkin seeds in preheated oven until crisp and golden brown, 60 to 90 minutes.